I am pretty happy with how it turned out! The reason that it took me so long, is that I couldn’t decide how to create the plush toy. I started working in the round, but then didn’t want to just sew white patches on. Tried working with changing color each round, but it started to get complicated and not line up correctly. Consequently, I ended up with a combination of working in the round and then rows. The white part is sewn to the charcoal grey, but not on top. The pieces are created as two seperate parts and sewn together. You can get the pattern for the plush toy here. I am excited to announce that we are having twins! 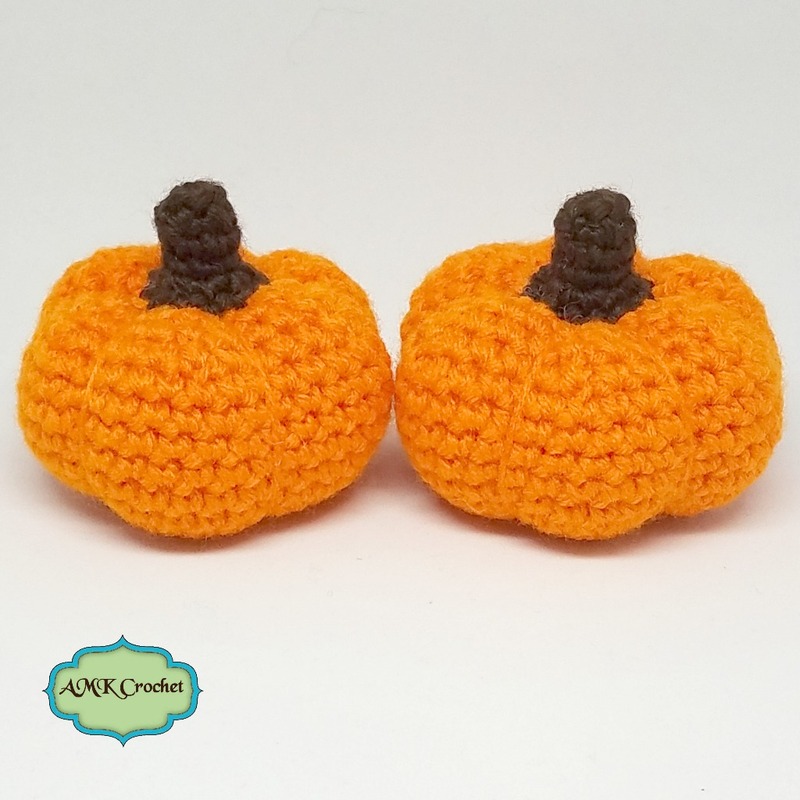 Since it’s Fall, I just had to have crochet little pumpkins in our announcement! 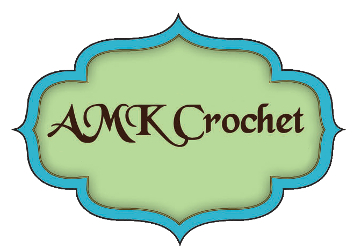 Along with my AMK Crochet business, I am a nanny for an adorable little toddler, who is turning two! I started working with her a year ago, when I moved to Seattle. I have been trying to decide what to make her, for her birthday, that would be fun and not take up too much space. Her mom already creates cute clothing (you can see it here) and she has been gifted crochet blankets, from family members. 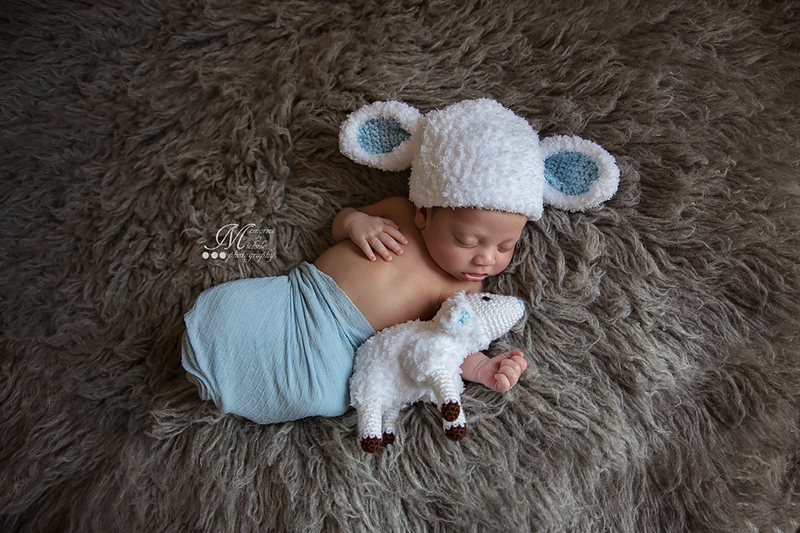 With most of my items being newborn photography props, I needed a new idea! Looking through Pinterest and Etsy, for educational toddlers items, I was reminded of quiet books. 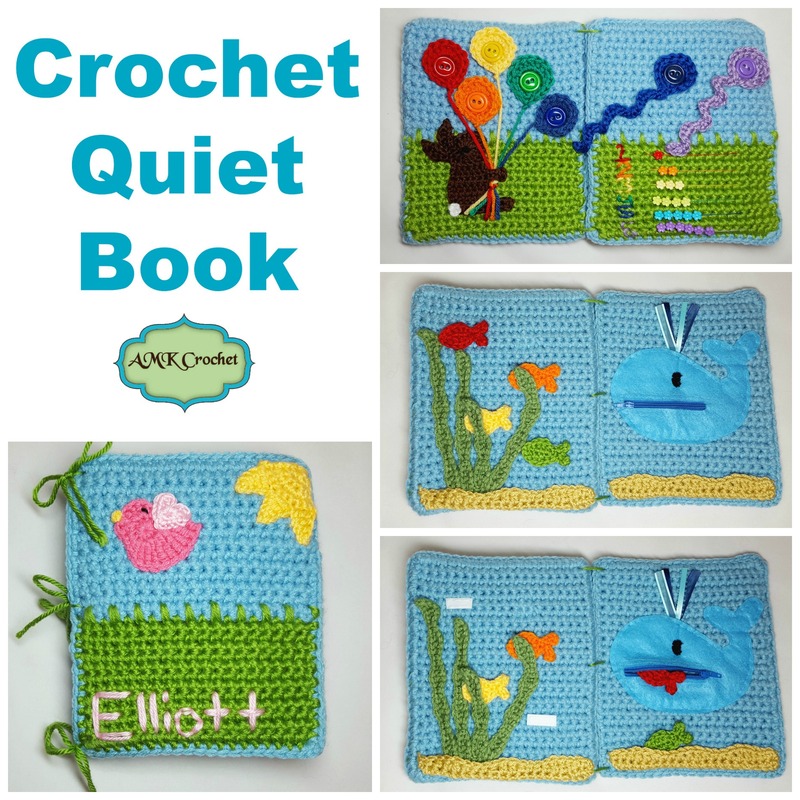 The basic idea behind a ‘quiet book’ is to have a handmade book (typically felt/flannel) to entertain children in an educational and fun way, that just so happens to keep them quiet (hopefully). The little girl I nanny for is very smart and has a surprisingly long attention span, so this seemed like a great option for her, especially since she has been traveling a lot lately. I wrote this pattern last year and as I am going back and reformatting my patterns, I have decided to retire this one, as a free pattern! I hope you enjoy! I was thinking about a Valentine’s day outfit that was simple and sweet, which led to the creating of newborn angel wings and halo. 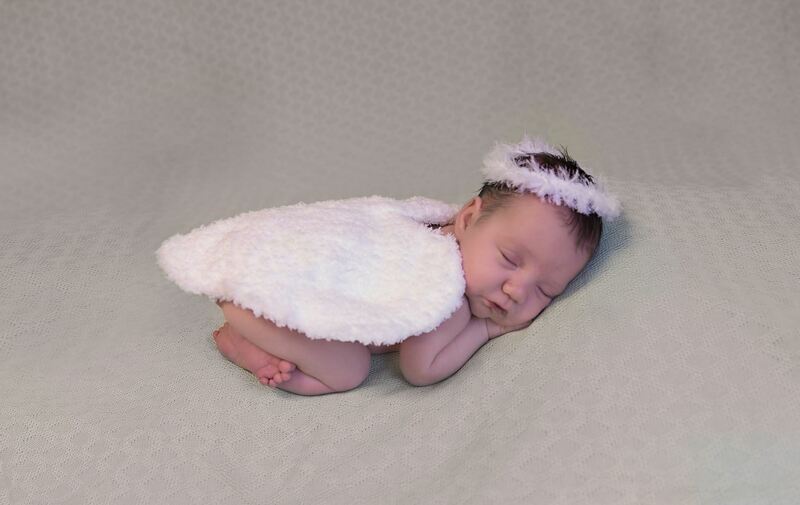 Although, I feel as though an angel outfit could be used year round for a newborn, but I love the idea of it for Valentine’s day. Also, it’s great for those parents that don’t know the gender or want more gender neutral outfits. For my sister’s birthday, she wanted a baby tortoise. Her husband ended up getting her two and they came up with the names of Princess Peach and Bowser. Of course, I had to try to make each of them a cozy, to match their names. 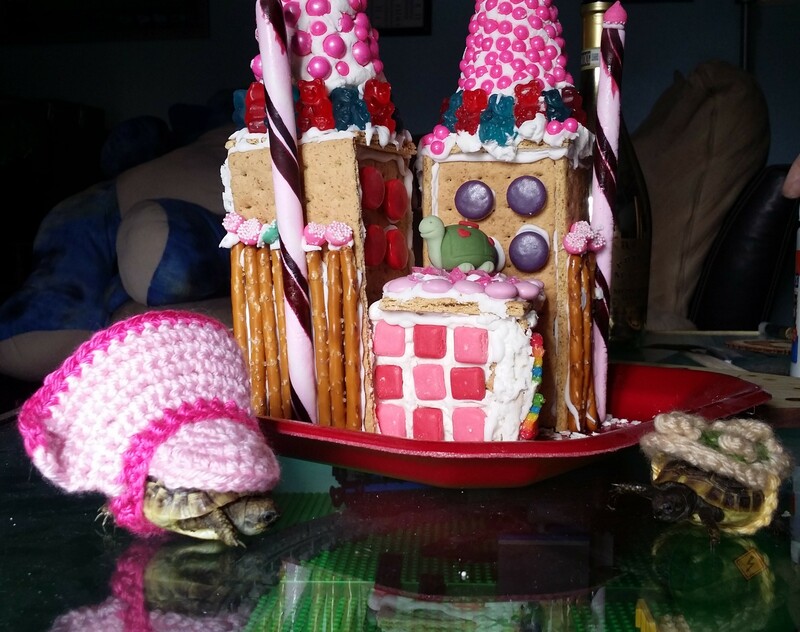 I don’t know much about tortoises, so I started searching around online and found an Etsy store that sells turtle cozies. The shop is currently on break, but there are links to other Etsy shops that sell them. You can see them here. Taking a look though her sold orders, you can see some adorable outfits. Although, I had the problem of my sister’s tortoises being babies and since she lives in Texas and I live in Washington, I can’t just go try them on. I was clueless on sizing and measurements, so I went off of measurements in the photos she sent over. Bernat Pipsqueak yarn is a super soft, bulky weight (size 5) yarn, that comes in several fun colors. 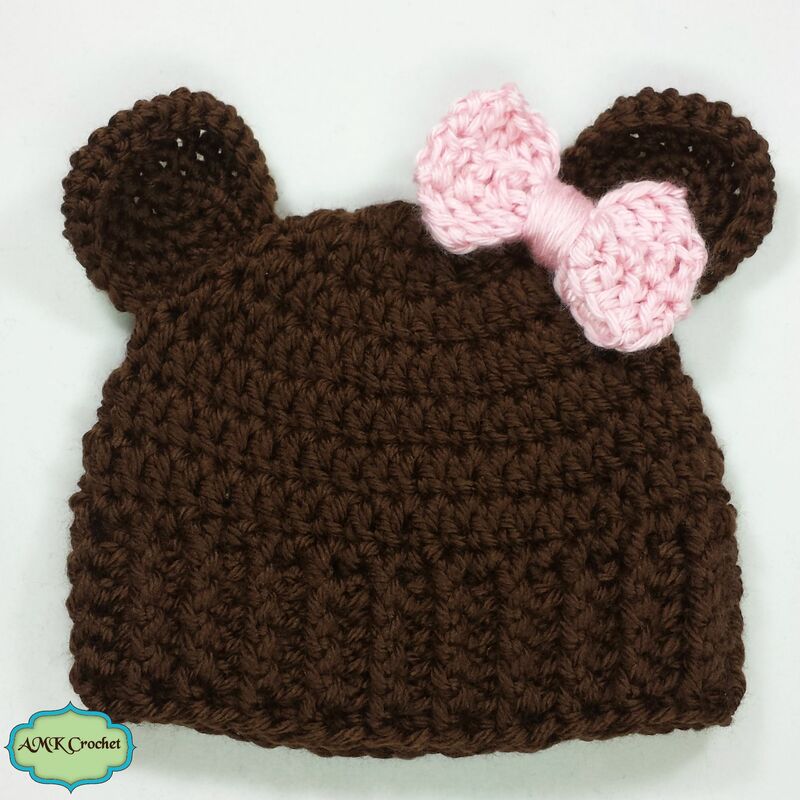 I love how soft it is and use it for several of my newborn outfits. I have had a lot of people ask me how hard Bernat Pipsqueak yarn is to work with and I honestly don’t have a great answer for that. It really varies from person to person, but there is the benefit of the fuzz hiding mistakes. 🙂 The problem with this fuzzy yarn is that you really can’t see the stitches, so you have to go more off of how it feels and almost just know where the next stitch goes. However, once you get the hang of it, it works up quickly for some fun baby items. I highly recommend counting your stitches each row! It definitely gets easier the more you work with it though, which brought about this free pattern. 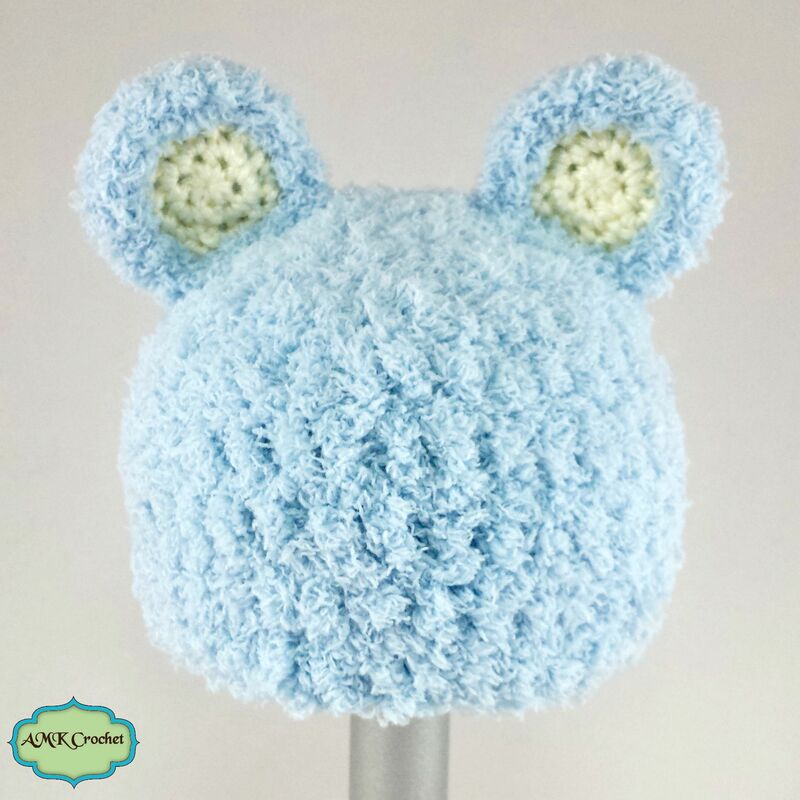 This way you can give the yarn a try, while making an adorable bear hat. 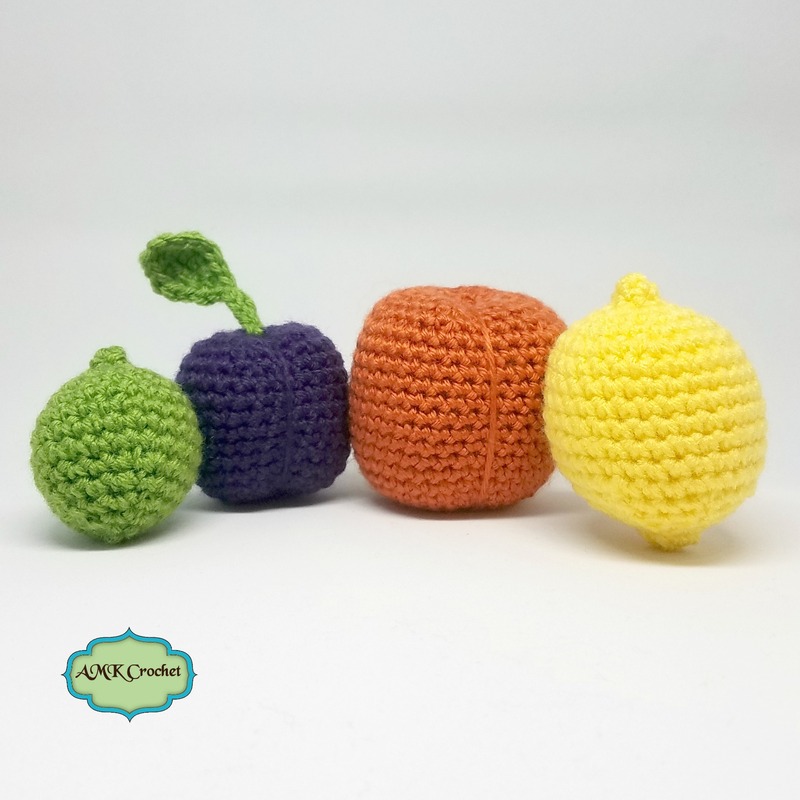 Then, if you want to try another, you can head over to my ‘patterns for sale’ section and I just published another free pattern in pipsqueak yarn! This is my second free bear hat. The first free pattern I used bulky weight pipsqueak yarn, so I am using worsted weight yarn for this one. 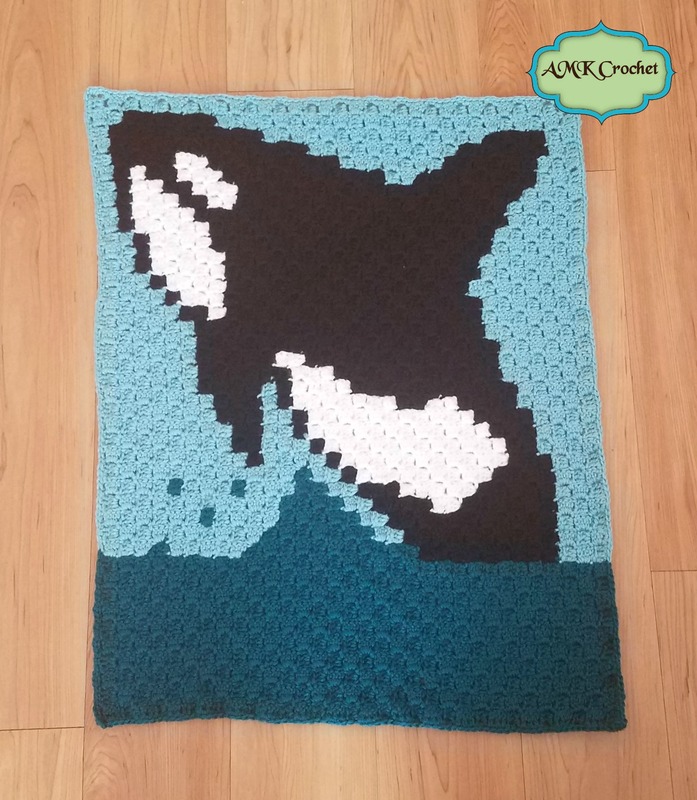 🙂 To get my first free pattern, click here. I wanted this hat to be a little bit different, so I decided to use front post and back post double crochet, for some ribbed texture. 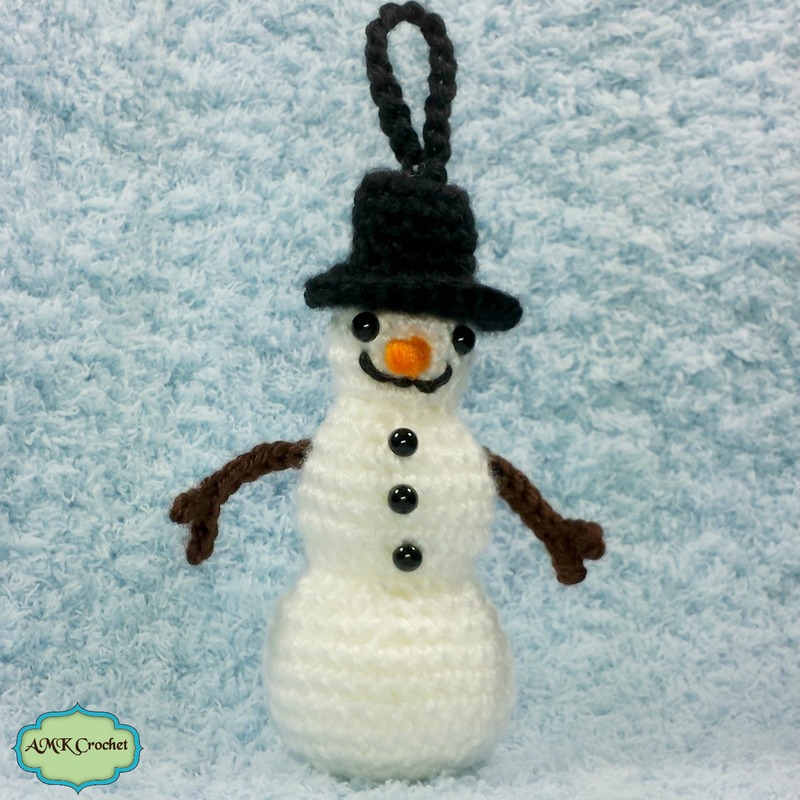 After making my newborn snowman cocoon and hat I really wanted to make another snowman item! I wanted to make something for more than just newborns and ended up with making a little ornament. This way it can be a simple decoration for winter, on the Christmas tree, or for your new baby’s first Christmas. I was originally going to have the ornament match my newborn set, but I thought a little more neutral might be better. I just love the photo that Michele took for me though!